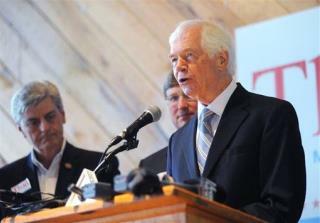 (Newser) – Mississippi Sen. Thad Cochran and Tea Party-backed challenger Chris McDaniel pointed toward a possible June 24 run-off after battling to a near-draw yesterday in a primary that underscored Republican differences. Unofficial returns from 98% of the state's precincts showed McDaniel with slightly more than 49% of the vote in a three-way race and Cochran with slightly less. It takes a majority by one candidate to avoid a run-off. The race—arguably the year's last good chance for the Tea Party to topple an establishment favorite in a Senate primary—took a turn for the sensational last month when four McDaniel supporters were arrested and charged with surreptitiously taking photographs of Cochran's 72-year-old wife, who suffers from dementia and has long lived in a nursing home. State Sen. Joni Ernst overwhelmed her rivals in Iowa, easily surpassing the 35% total needed to win the nomination outright. She will take on Democratic Rep. Bruce Braley this fall for the Senate seat long held by Democrat Tom Harkin. In South Dakota, former Gov. Mike Rounds won the Republican nomination and quickly became a favorite to win a seat held by retiring Democratic Sen. Tim Johnson. Rick Weiland is the Democratic candidate in the heavily Republican state. And in Montana, appointed Sen. John Walsh, a Democrat, and Republican Rep. Steve Daines won nominations en route to a fall campaign that the GOP is expected to target as an opportunity to gain a seat. the RUNOFF will be the LEGAL USA RESIDENT VOTERS who will change the future for the USA in the NOVEMBER TO REMEMBER cause that's.... When the DUMOCRATS LOSE & the REP WIN BIG on NOV 4, 2014!!!! CAUSE THE LEGAL USA RESIDENTS VOTERS KNOWS THAT,,,!! America is worth fighting for, to ensure future generations enjoy the same opportunities we’ve had to gain an education, get a job, start a family and live in peace, **UNHARRASSED BY A MEDDLING,CENTRALIZED MONOLITHIC GOVERNMENT IN TODAY'S USA***!!! ALSO.. Then in Nov. 08, 2016 Gov. Christie will be prez!!!! and everything will be AOK in the USA on Jan 20, 2017!! there ya go!! All the Democrats have to do is continue to remind the voters about the 16 day GOP sponsored government shutdown that cost the U.S. economy $24 billion. Just say "NO!" to the party of "NO!" this NOvember.